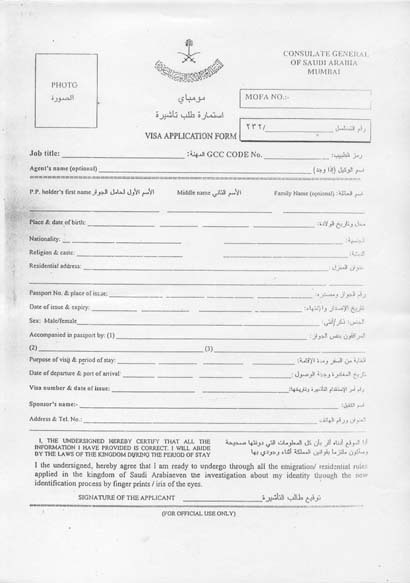 You want to apply for visa of Saudi Arabia give us a miscall on 022-66209999. F - Maker Towers, 4th Floor, Cuffe Parade Mumbai 400 005. 4 Photo (35 x 45 mm white background face size 25 x35 mm). Covering letter (address to Consulate General of Saudi Arebia, Mumbai). Visa approval slip from immigration is mandatory with visit type (visiting trading), also note that in invite pax designation should be Manager/ Executive/ Officer if they mentioned engineer then visa will be not issued. Original Degree cert of Applicant. This is to inform you that now a days 80% online invitation application got rejected, some time consulate give reason sometime consulate rejected without giving any reason, So kindly try to arrange Ministry Approval Visa from Saudi Counter Part for your safer side. Fee Rs. 4600/- + handling charges of Agent (Single Entry). Fees Rs. 10500/-+ Handling Charges of Agent (Multiple entry). Note: Visa form should be typed.